It was quite weird. I thought the emperor had come to town, but no, it was just some guy on a donkey. There were palm leaves everywhere, and everybody was waving and cheering. I said to the missus, “I reckon someone’s got their wires crossed”, because this was the same guy who’d been wandering the countryside for the last three years telling everyone how he loved them and that they should be nice to each other. Jesus they called him. Rumours were that he spent a lot of time hanging around with drunkards. Fond of the wine he was, even made his own. But here he was, swanning around like he ruled the whole world…but sat on a donkey! Not even a horse or a camel, nothing substantial. Absolutely mad. I mean, as time went on, it was clear that even his mates didn’t like him. There was that one, Jude or Jeremy or Judas or something, he came to him while he was at Gethsemane, having a bit of quiet time. Wanders up to him, plants a kiss on him. Now, see, that’s not as weird as you might think, because round here we are a friendly lot. But this was a signal to the Roman guard. They piled into the garden, and arrested that Jesus. Not surprising. Bit of a troublemaker. One of his mates, he takes it upon himself to start swinging his blade around, only goes and chops off somebody’s ear. Jesus is all like, “Give over soft lad”, but his mate is all worked up. I reckon Jesus was expecting it, being arrested. From what I can make out, the Romans as a whole – no offence, mate – were a bit scared of this Jesus. He’s going round telling folk to be nice, and he’s building quite a following. Your lot are going round stabbing and murdering in the name of the emperor, and exerting control through force. I think the emperor was worried that love was stronger than violence. But what do I know, eh? And Ponty is like, “But he’s done nowt wrong!” but it’s too late and he’s lost the crowd. They’ve got murder on their minds, and if it’s not Jesus that’s getting murdered, it’s gonna be Ponty. And Ponty is none too keen on that. I mean, there’s probably something wrong with Ponty, but that’s not the point. So Jesus gets hauled off, and they beat him up some more. Like -really- beat him up. He ends up in his undies and they ram a crown made of thorns on his head. Have you ever caught your finger on a thorn? Imagine tons of them tearing into your head. Not good. I mean, I even pity the chap who had to make that thing. Then they give him a great big cross to carry. Massive thing. Heavy as. They’ve about killed him already, you can see parts of him you shouldn’t be able to see from the outside, blood everywhere. And then they want him to carry half a forest up a hill. Not happening, my friend, not happening. He collapses half way there. Out of the crowd that’s stood there watching, this bloke comes out. I wasn’t fully paying attention, some say he volunteered, some say he was volunteered. But whatever, turns out he’s from Cyrene, which is in Libya or something. He picks up the cross and takes it up the hill. Now, the hill is quite important. It’s called Golgotha to us lads. Nobody round here really knows what it means, but some bright spark says it means “Place of The Skull”, which is all a bit dramatic, but makes sense I guess. The Romans don’t call it that, because they’re all la-di-dah with their Latin, and call it Calvariae Locus, which also means Place of the Skull. Some foreigners shorten it to Calvary, but what do they know? Anyway, the cross is up there on Calvary, and the Romans are about to attach the Libyan to it, and he’s like, “No, no, it’s not me – it’s that bloke there,” so they cop hold of Jesus and lie him down on the cross. Now, I think I forgot to mention he’d been whipped on his back before this, so laying on a bit of wood would have hurt pretty bad. But this is rough-hewn wood, full of splinters, bad enough just to touch with your hands. Proper hurt him it did, but they still weren’t done. They nailed him to the cross. An actual living human being, great big iron nails, straight through his hands and feet. Well, somewhere around there. Might have been wrists and ankles, I looked away right then. There was a definite crunch. Broken bones for sure. They propped the cross up and hung a sign over his head, “King of the Jews”. Some of the Jews were a bit unhappy about this. I mean, they never voted for him or anything, so it’s a bit of an assumption. He’s there for a bit, and there’s women weeping at his feet. Someone said one of them was his mum. Must have been awful for her. But while he’s up there, he’s chatting away with these two lads that are hung up next to him. He’s telling one of them that they’re going to paradise together. What’s that all about? He’s filling this guy, in agony, with hope that something better is to come. You’ve got to wonder about him. Anyway, it’s about time for my afternoon snack, and the weather turns. Dark clouds, the lot. I’m wondering if the missus has left the washing out, but all of a sudden The King of The Jews yells something I didn’t quite catch. It sounded like he was shouting for Elijah, but the bloke next to me said it something about asking God why he’d given up on him. Someone offered him some dodgy wine on a sponge, and he yelled again. Who puts wine on a sponge? And that was that, he was dead. Then to top it all off, there was an earthquake. Next thing you know, the lad from down at the temple is out on the streets, shouting about the curtain being ripped. Massive great curtain, separating the holiest part of the temple. Top to bottom, straight down, massive rip. This lad is in a hot sweat, thinks he’s gonna get the blame for it, but that curtain was so strong there’s no way he could have done it on his own. Bit weird, but now anyone could get in to the holiest part of the temple. There was no separation from God, which was causing some folks a bit of concern. There’s a Roman guard, and he’s all, “Maybe this is a trick and he’s not dead,” so he pokes Jesus with his spear, and then it all gets gross. Blood and water spilling out a hole in his side. Fair put me off my afternoon snack. This chap appears next, Joey Aromatherapy or something, bit well-to-do. He gets them to take the body and wrap it up and bury it in a tomb he had ready and waiting. I mean, you get all sorts round here, but how many people have a spare tomb lying around? And that was that. He’s proper dead, holes in him, chucked in a tomb. They put a big stone in front of it and set up a guard, because there were rumours that Jesus was going to beat death, and they didn’t want any nutters stealing his body and going, “Oh look, he’s alive again,” and they’d be operating his arms by pulling strings or something. So we get on with our lives, no problems, and we hear that Judas has hanged himself. He felt guilty about what happened. A sad affair all round, if you ask me. Couple of days go by, all is well. And then, somebody said Jesus was back. I said to the missus, “I’m nipping down to the tomb to have a word with them guards”, but when I got there, the stone is rolled away, no guards in sight, and a great big empty tomb. And then stuff got proper weird. People saw Jesus all over town. Some saw other people who had died too, reckoned they’d come back. One lad even saw Jesus talking to someone and he was sticking his fingers in his wounds. Mad! I wouldn’t have believed any of this, of course, but then one day, I saw him. I saw Jesus. He wasn’t dead, but very much alive. He had beaten death. How about that? It gives me hope. Hope for the future…hope that there is more than this. I mean, this life is OK, isn’t it? But it’s good to know there’s something after. Something to look forward to. 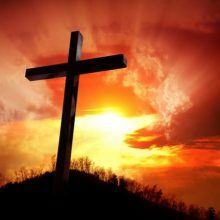 Some say that Jesus died on that cross as an offering for the wrongs of all the people in the world, forever. Not just those that were alive at the time, but those still to come as well. What an amazing man. What an amazing story. What an amazing thing that you are forgiven because Jesus died for you and me. Notes from Roman guard: Hope is here. There’s nothing we can do to stop it. Suggest we find out more about this Jesus and everything he stood for. Hope is definitely here. Driving around the Christmas lights!